Great research aid <> Put your ancestors on the map <> Looks really good framed <> Makes a lovely present or prize <> Supplied flat unfolded. Attractive, informative Victorian map showing sufficient detail and features to be of real use to researchers, metal detectorists, local and family historians: in fact anyone interested in how the county looked over 150 years ago. The scale is a five miles to one inch (3km to one cm), approximately, depending on size of county. The map has been superbly reproduced, using special enhancing software, at around 150% original size from Thomas Dugdale’s Curiosities of Great Britain(1846) and is by the reknowned mapmakers Cole and Roper. 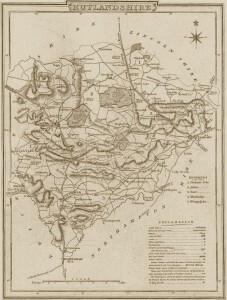 The map contains an abundance of information such as detailing the Hundred divisions (or equivalent), market towns, manors, polling places, Roman antiquities, roads and waterways. Also included are many castles, abbeys and priories. Please note: These maps are faithfully reproduced from 1846 originals and as such, flaws in the originals may be reproduced also, in particular the boldness of the printing is somewhat variable from map to map. 99% of clients have been delighted with these maps but if you are not happy with your purchase just let us know and we will gladly give a full refund. If you require more than one map sent at the same time to the same address, please contact us for a quote and we will be happy to apply a postage/shipping discount.